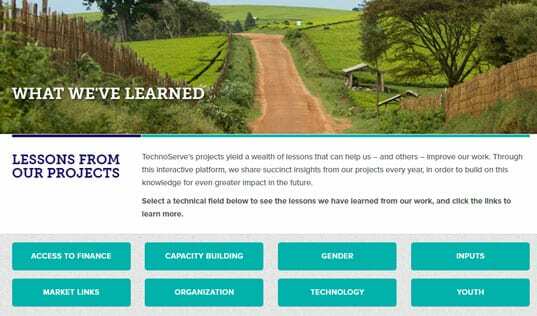 After Elizabeth founded a business group to collect milk with other Maasai women, they partnered with TechnoServe to improve their yields and business practices and increase their incomes. Cooperatives are recognized as one of the strongest engines of economic development, illustrating the power of simple, well-implemented business solutions to create thriving economies in even the most challenging market systems. At their core, cooperatives are simply enterprises formed when any group comes together to meet the same economic, social or cultural needs. In Kenya, dairy cooperatives provide the Maasai community a pathway to increased incomes while providing women a platform from which to preserve their culture and grow their communities. Milk is Kenya’s most important livestock product; the dairy industry contributes over 3 percent of the country’s total GDP and employs 50 percent of the agricultural labor force. TechnoServe is working to improve dairy livelihoods in Kenya, helping pastoralists and farmers to establish dairy business hubs. One of these cooperatives is the Maasai Women Dairy, the first dairy plant in Kenya owned almost entirely by Maasai women. The 1.5 million-strong community of Maasai is spread over 40 million acres in Kenya and Tanzania, where they proudly maintain their traditional pastoral lifestyle and cultural identity despite the pressures of the outside world. Their livelihoods revolve predominantly around cattle, which are a source of food and a sign of wealth. Long distance travel in search of fodder and water reduces milk yields and incomes in East Africa. 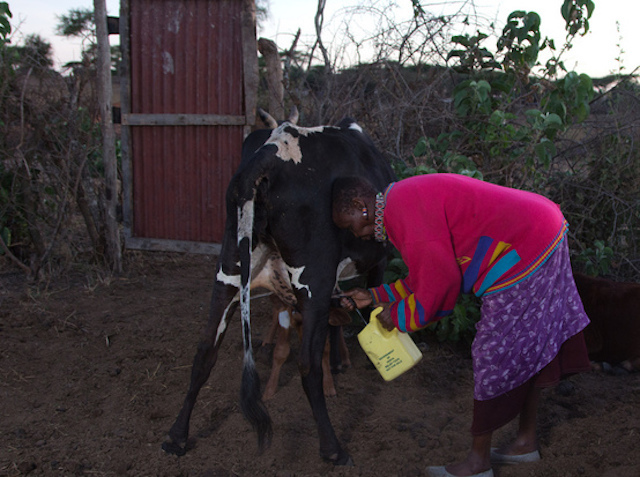 Women are typically the milk traders in Maasai households. However, Maasai women face numerous challenges in providing for their families. Seasonal lack of water – worsened by prolonged droughts in recent years – lowers their cattle’s milk producing capacity. This low yield is exacerbated by grueling travel in search of increasingly scarce water and fodder as the dry season stretches on. In spite of these challenges, these enterprising women are able to stabilize and increase their incomes by forming effective cooperatives. 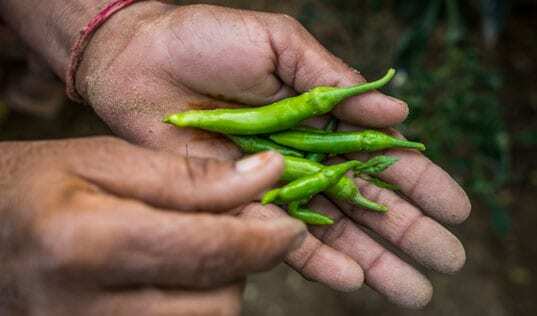 Through the cooperative, members can pool their resources to implement best production and business practices, ultimately improving yields and incomes. TechnoServe is helping Maasai women to transform their lives by teaching key business skills for cooperative management in conjunction with effective dairy farming techniques. The benefits to women cooperative members are then amplified throughout the community as a whole, as most of the income Maasai women make from their milk sales goes toward household and family needs. Forming a cooperative enterprise for a better community. In 2003, Maasai women of Kajiado County formed a business group that collected milk from members to sell in neighboring towns. However, the proceeds were meager until August 2011, when they partnered with TechnoServe to establish Maasai Women Dairy as a formal cooperative and to continue educating their farmers on the benefits of collective milk marketing along with best practices to increase their yields. 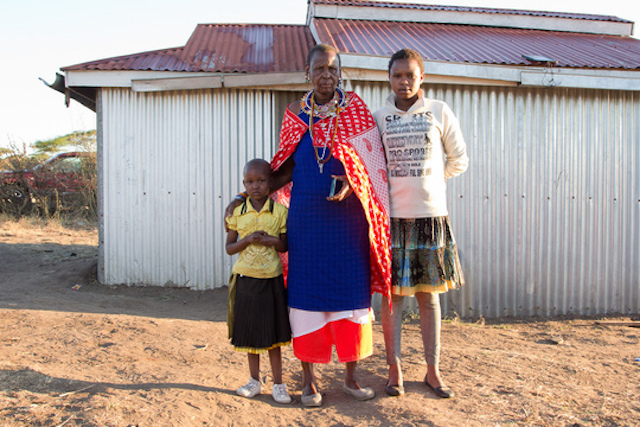 Producing more milk and selling into a more reliable market, the Maasai women increased their incomes, improved their family’s livelihoods and gained more decision-making power within their communities. The cooperative quickly grew to over 4,000 active members and quadrupled its sales in just two years. 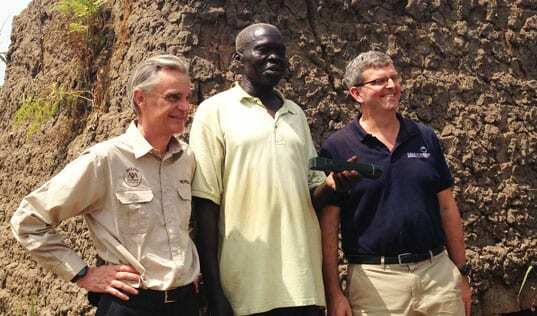 Sustainable solutions for an uncertain future. However, even with the knowledge and skills to make the most productive use of their resources, cattle and businesses, creating lasting prosperity for the Maasai and greater dairy communities means addressing the lack of resources as essential as water. Kajiado County suffers from a prolonged dry season. 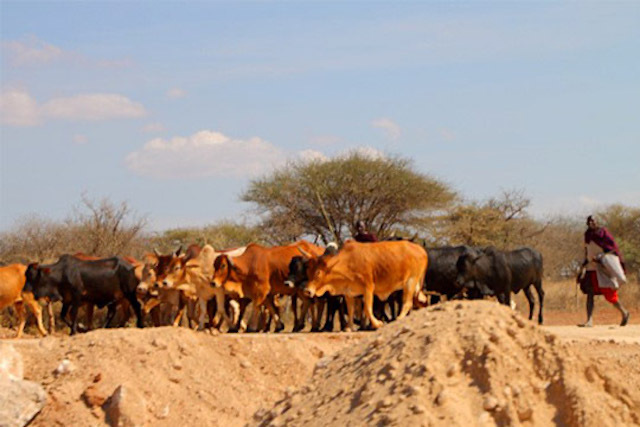 While close to a third of Kenya’s population lives in arid and semi-arid climates, over 70 percent of the nation’s livestock is concentrated in these challenging regions. While Maasai cattle have the potential to produce between 10 and 15 liters per day, their production can drop down to zero liters in the dry season, which can last half the year. On average, each household loses two animals during dry seasons, and prolonged drought can greatly damage the income security that farmers have worked so hard to achieve. Furthermore, the prolonged droughts of recent years have caused many Maasai to abandon their land and dairy businesses. Large manmade lakes, known as "nadi" in India, can hold over 10 million liters for communities in India and East Africa alike. As part of the Feed the Future India-Africa Agriculture and Natural Resource Management Innovation Sharing Platform – implemented by the U.S. Agency for International Development (USAID) – TechnoServe India, our team in Kenya, and the Maasai Dairy Cooperative are piloting cost-effective innovations from India that can increase stable access to water and feed in Kenya, bolstering pastoralists’ resilience during dry seasons and droughts. Together, TechnoServe staff and the Maasai communities are implementing the Five Percent Fodder Farm Model and building nadi (manmade dugout lakes to catch runoff rainwater). These proven technologies were developed and tested across India – including in the semi-arid deserts of Rajasthan, India – and present a sustainable response to changing drought durations in East Africa. Although some water-capture techniques might be unsustainable for these communities – for example, metal roofs and storage tanks are rare, making roof-top capture problematic – the soil in these regions can hold water, allowing for a simple, sustainable and cost-effective solution to drought-related decreases in milk production. TechnoServe staff consult with community members to select an appropriate site located on a slight slope and then excavate a pond to catch runoff rainwater. These ponds vary from small, on-field farm ponds (measuring a few 100 square meters) to nadi with a water-holding capacity over 10 million liters. 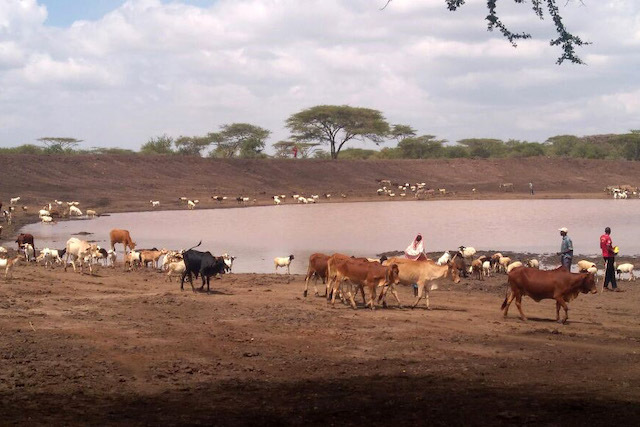 The ponds not only provide water for the cattle, but also for the surrounding soil, which is then cultivated in alternating patches of legumes and native, drought-resistant species of fodder trees and grasses. These plots yield sufficient water and feed to sustain the small herd of Milch cattle that communities keep during dry season. By eliminating the need to travel great distances in search of water and food, cattle health production improve, keeping incomes stable whatever the weather. In order to ensure cooperatives will have access to the services they need to continue dam construction and maintenance, TechnoServe is training young local men in dam construction, providing employment opportunities and long-lasting change for farmers. TechnoServe aims to benefit 700 farmers by building community structures as well as modifying existing structures, and the model is a promising opportunity for future water solutions in the greater region. With stable access to water and stable income, the women of the Maasai Dairy Cooperative are improving their farms and businesses, and creating a better future for their families.